Who knew that pronouns can predict romantic compatibility, reveal power dynamics, lying, and who will recover from trauma? 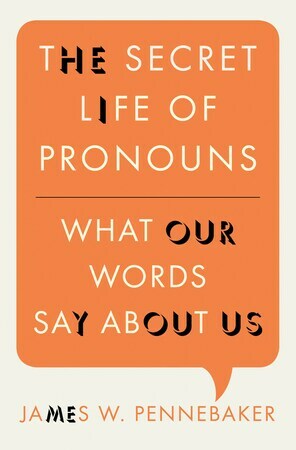 James Pennebaker, a psychologist at the University of Texas at Austin has been tracking the truth of pronouns for 20 years. He includes them in the group he calls “function words,” necessary parts of speech that are invisible to us in conversation: the, this, though, I, and, an, there, that, he, she, where, when. Pennebaker contrasts these with “content words,” which carry meaning and evoke images in our minds, words like, school, family, life, friends. In a recent NPR interview, Pennebaker related that he and his students studied couples’ compatibility in the context of speed dating, http://tinyurl.com/7skcgf4. Computers proved an essential tool for analyzing results, since try as we might, we really don’t hear function words. By entering both the transcript and the speed dating outcomes, Pennebaker’s team discovered a strong correlation between matching function word usage and the decision to get together after the first meeting. The computer predicted who would hit it off more accurately than the couples themselves. This is not because similar people are attracted to each other, Pennebaker says; people can be very different. It’s that when we are around people that we have a genuine interest in, our language subtly shifts. The other discovery Pennebaker discussed in the interview centers on power dynamics. When two people with different status or power interact, the subordinate uses “I” much more frequently. Pennebaker suggests self consciousness is the cause, concern about how we’ll be perceived. Finally, Pennebaker weighed in on the My Fair Lady question: if we change our language, do we change? After 20 years of research, Pennebaker says no. Change who you are and your language will change, but not vice-versa. This entry was posted in Authors, Books, Psychology and tagged authors, books, Language, Psychology, Science. Bookmark the permalink. This never crossed my mind either. I know language matters and can signal more than a speaker intends, but I usually only notice it in “big” words. This is why I enjoyed studying Psychology, all of the little things that you can find out about people from things that most of us would never suspect as having any impact whatsoever. You can find out a lot about the personalities of people from things that we never think about. There’s an interesting book titled Snoop: What Your Stuff Says About You by Sam Gosling (oddly enough Dr. Gosling is also from the University of Texas at Austin). This book deals with how much you can tell about a person’s overall personality based upon what they have in their room. I’ll definitely have to check out this book, it sounds interesting. Thanks, Adam, and I’ll have to check out Snoop.